Applications received by December 1, 2015 will receive full consideration. The position will remain open until filled. 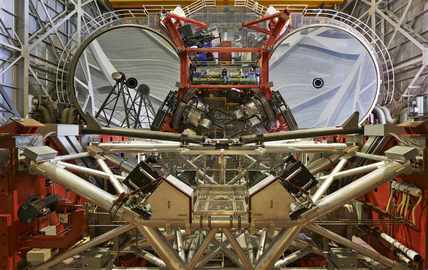 With its two 8.4m mirrors on a common mount that can be combined to form an interferometer with a baseline of 23m, complemented with adaptive secondary mirrors, the LBT provides unprecedented ground-based resolution at near- and mid-infrared wavelengths. With a suite of state of the art instruments nearing completion, the observatory is moving to full operation while adding new capabilities such as ground-layer AO and new AO-fed instrumentation. The Engineering Group, with around fifteen engineers and technicians, is responsible for the technical (mechanical, electrical, optical) support of the telescope and its instrumentation (including AO systems), in close collaboration with the Software and Science Groups (all based in Tucson), and the Mountain Operations Group, based in Safford and working on Mt Graham (3200m). The successful candidate to the Head of the Engineering Group position must have a strong engineering background (systems engineering preferred) and must be highly motivated by the management of a diverse and highly skilled staff in a complex operational environment. S/he is expected to take over technical and administrative leadership, and develop and maintain efficient contacts with the other Groups and the external teams contributing to the development of the observatory. Experience in a similar position at a large research facility (astronomical if possible, but not mandatory) is required. The Engineering Group Head reports directly to the Director, is a key participant in the management of the observatory, and a member of the Observatory Council.